This packet is a companion to the book that can be used for literacy centers, whole class language lessons, or for speech/language therapy in individual or group sessions. The book is not included and will need to be purchased separately. This packet contains 70 pages of content that is perfect for targeting a variety of speech and language goals. •Rhyme:Cut out the cards (pages 5-10) and match the rhyming words from the story. •WH Questions:Print and cut out all cards (pages 11-15). Mix the cards up and have the student answer each question focusing on which WH is being asked. •Verb Tense:After cutting out each verb card (pages 16-20) name the verb from the story listed on the left side of the card. Have the student determine the verb form for past, present, or future tense. If laminated, students can select their answer using a dry erase marker. 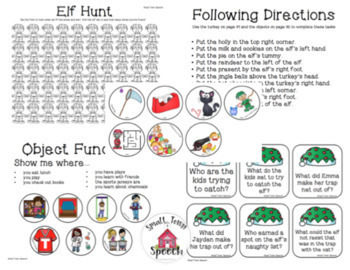 •Elf Chase Sequencing:Print the sequencing map (page 21) and the story sequencing circles (page 22). Place Velcro dots on the back of each circle and let students retell the story putting the parts in order. •Object Functions:Use the sheet on page 23 to have students identify the function of each of the rooms/areas within a school. If students can complete this receptive task have the students state what they do in each of these rooms/areas. •Comprehension Cards:Use the comprehension cards (pages 24-26) to test your students comprehension of the story. •Yes/No Comprehension Questions:Use this sheet (page 25) as a follow-up of reading the story and answering the comprehension cards. 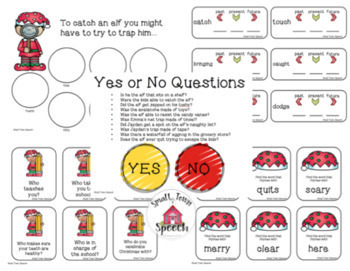 •Elf Hunt:Use the Elf Hunt sheet (page 26) and the elf die (page 27) to collect as many elves as they can. This can be used for articulation productions or language tasks (ex. stating synonyms, antonyms, rhyming words, etc.). Whoever “hunts” and covers all of the elves first wins. 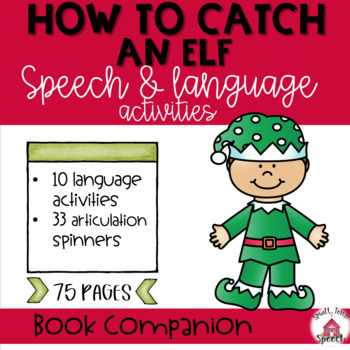 •Following Directions:Using the elf mat (page 31), direction list (page 30), and the objects in circles (page 32) you can target students receptive language skills. Have the student cut out all of the objects on page 32. Then, read the directions from page 30 aloud and have students glue the objects according to the directions onto the elf mat. 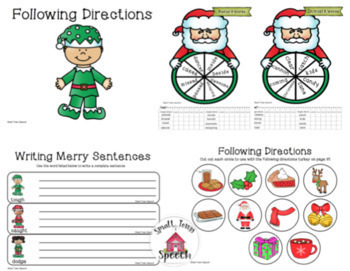 •Elf Sentences:Use the elf sentence strips (pages 33-41) to have students practice writing sentences with the given word on the left side of each card. Words provided are verbs from the story. •Articulation Santa Spinners:Articulation spinners are included for the following sounds in the initial/medial/final position: K, G, T, D, SH, CH, S, Z, L, Voiceless TH, and Voiced TH. They can be targeted at the word/phrase/sentence level. Cutoff the bottom portion of the sheet for easy data tracking. Usinga pencil and a paperclip create a spinner by placing them in the middle of the spinner and having the student flick or slide the paperclip. Record the level (word/phrase/sentence) next to the trial word on the attached data sheet. Have the student complete each target word five times at the desired level and record their responses for easy data tracking. Have the student color each word after targeting it. Continue spinning and completing trials until all of the pie pieces have been colored.